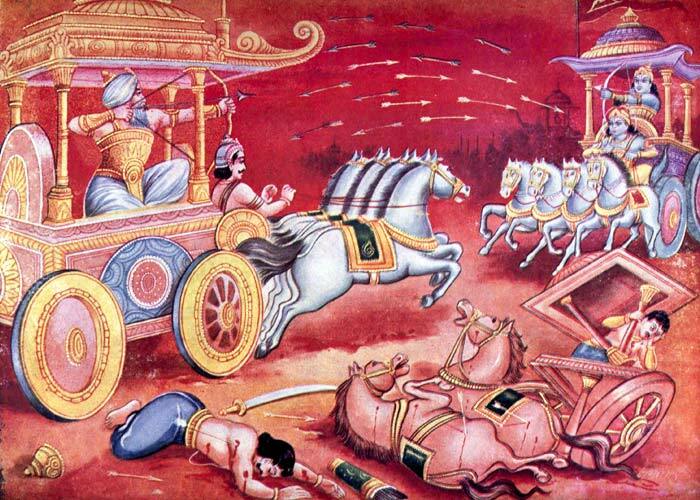 Want to know how can the Mahabharata help you succeed in life? Read on! As an epic tale, the Mahabharata remains unrivalled in length and complexity, weaving stories within stories with aplomb. While its historical context is debatable, there can be no disputing that it contains a wealth of spiritual and philosophical material. It has life lessons to offer that are relevant in the contemporary world today. Though characters in Indian epics are revered and given a divine status, they are completely humanised by their own struggles. Krishna may have revealed his Vishwaroopa to Arjun, but he was a wily strategist and steered the Pandavas to success in the war of Kurukshetra, with a carefully orchestrated master plan. Personally, I have always felt that winning the war came at a tremendous cost for the Pandavas. But it was what they set out to achieve and they were annihilating in their success. So what lessons in success can we learn from this motely bunch of heroes and villains? The Pandavas considered Krishna their mentor from the time they met him -- their faith in him was absolute, and his word was their command. He was a mentor who understood their weaknesses and strengths, someone who could advise, criticise when required and hold their hand and show them the right and more importantly, righteous path. Duryodhana, on the other hand, had Shakuni -- a corrupt, conniving and scheming man who made it his business to bring out the worst in Duryodhana. The Kaurava prince was not without good qualities. He was a brave warrior, a loyal friend and a just king. He is commonly vilified as the personification of evil, but it is to be remembered that when the time came for the kings to choose sides in the war, Duryodhana had 11 akshauhunis versus the Pandavas seven. He crowned Karna the King of the Angas just to remove the stain of sutaputra from his name, and remained his loyal friend until the end. But in the hands of Shakuni, Duryodhana let the worst side of himself come to the fore. It is important to have a mentor that sees your true potential and helps you achieve it instead of leading you down the road of negative emotions and revenge. In the first few days of the war, the Pandavas had a difficult time facing the onslaught of their grandfather Bheeshma, who was the commander to the Kaurava army. He was unbeatable, and was creating mayhem in the Pandava army at Duryodhana's behest. The Pandavas knew that he could not be killed by ordinary means. They made a warrior known as Shikhandi face Bheeshma, and the Pandavas along with other maharathis stood behind Shikandi. They knew Bheeshma would not attack Shikhandi because he had once been a woman -- in this convoluted way, they were able to injure Bheeshma and get him out of the war. Similarly, when Drona became too hot to handle, the Pandavas killed an elephant in their own army by the name of Ashwatthama. Drona's son too was called Ashwatthama, and when Yudhisthira announced that Ashwatthama was dead, Drona was too disheartened to fight any more, and the Pandavas were able to kill him. These two are instances of bending the rules, but were a means to an end in a dire situation. When Drona was teaching the Pandava and Kaurava boys archery, he was accused by Duryodhana of favouring Arjuna. To prove why he thought Arjuna was the most superior warrior of them all, Drona placed a wooden bird on a branch and asked the boys what they could see when they took aim at the bird. All of them replied in the same vein, that they could see the bird, the branch, the sky, the tree, etc. When it came to Arjuna's turn, his reply was, "I see only the eye of the bird." Arjuna's unerring focus was the secret arsenal from which his greatness stemmed. With his eye focused only on the prize, he was leaps and bounds ahead of those who were distracted by everything around them. In the modern world, distractions are many, and when you take your eye off the ball, it can be detrimental to your success. When the Pandavas and the Kauravas were canvassing for support before the war of Kurukshetra, both Arjuna and Duryodhana came to ask for Krishna's support. Krishna gave them a choice; one of them could have his army, the fearsome Narayani Sena, and the other could have just him -- unarmed and not fighting. But since he had awoken and seen Arjuna first, Arjuna would choose first. Arjuna chose the lone, non-fighting Krishna without hesitation. Krishna was their mentor, he was everything to them. Duryodhana smiled, thinking he had got the best of the deal -- what use was one unarmed man against an army of skilled warriors! But Arjuna knew that even the best of resources, such as the Narayani Sena, were useless without the strategic vision of Krishna. It transpired that the lone Krishna, serving as Arjuna's charioteer, was all the Pandavas needed to win the war of Kurukshetra, and Arjun had chosen wisely. So we learn that even if something looks brighter on the surface, it's not necessarily the right choice for us. Look beneath the surface of the offer and choose what’s right for you, no matter how attractive the other option may look. Think about the consequences of your actions -- don't make emotional decisions! The biggest mistake you can make is taking and important decision in an emotional state. Shantanu was blinded by love for a fisherwoman, and he allowed his son Bheeshma to take a vow of celibacy. In his eagerness to marry an avaricious woman, he unleashed a series of events that led to the catastrophic war of Kurukshetra. Pandu too made a rash decision -- when he was cursed by Rishi Kindhama, he was so distraught that he gave up his throne to Dhritarashtra and went to the forest to lead a retired life. Had he thought it through, he may not have taken such an unwise decision, which led to the uncertain future of his five sons and their calamitous enmity with the Kauravas. The lesson to be learned is, hasty decisions lead to our downfall. All decisions should be analysed with a clear mind, while being cognisant of any future repercussions. The Bhagvad Gita, an intrinsic part of the Mahabharata, has life-lessons hidden on every page, but the one that is most commonly taught is that we should do our work without hankering after the reward. Many spiritual and philosophical explanations for this abound, but I like to look at it from a more practical point of view. I believe that all work is meditation; whether you are making a paratha or populating a spreadsheet, if you are focusing as you should be it is a form of meditation. If thoughts are clouding your mind about whether your husband will complement you on dinner tonight, or your boss will give you a promotion detract from that meditation. I truly believe that when we are not attached to the fruit of out actions, we are able to focus on our efforts in entirety, and consequently achieve better results. Hard and focused work always bears fruit, more so if we don't obsess about it. Abhimanyu knew how to enter the Chakravyuha, but he didn't know how to come out of it. That didn't stop him from breaking the vyuha and facing the wrath of the Kaurava maharathis alone -- it says a lot for his bravery, but not much for his strategic planning. His death at the hands of six great warriors was one of the more tragic and unrighteous acts committed on the battlefield of Kurukshetra, but it does teach us that in order to be successful, one needs to be prepared. Whether it's an examination or a presentation, being armed with all the facts is mandatory if one wants to succeed. Being properly prepared for the task at hand is one of the crucial steps to success. Author Anita Shirodkar recently released her fourth book, Guardians of the Blue Lotus - Aryavir, the first part of a trilogy, which is an epic mythological fantasy.